(NaturalNews) The 20th century was not kind to butter. Like eggs, coconut oil and many other nutritious foods, this beloved dairy product, which is made by churning fresh or fermented cream or milk, was a victim of the misguided war on saturated fats that began in the 1950s. 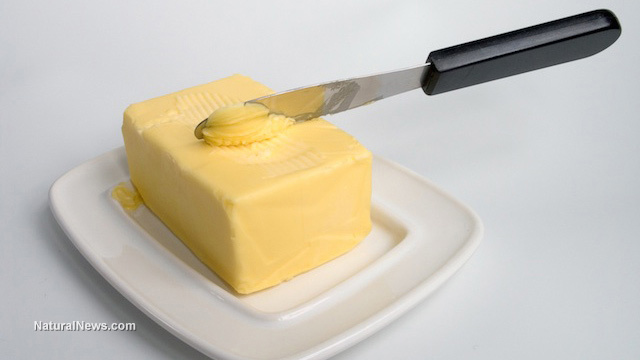 As a result of this war, the consumption of "low fat" butter substitutes, such as margarine, actually exceeded that of butter itself. Consequently, cases of heart disease and other cardiovascular conditions rose to unprecedented levels over the next few decades, prompting many researchers to question whether natural, high-fat foods were the culprits after all. Of course, we now understand that foods high in saturated fats are actually very good for us and produce a large number of health benefits. This is especially true of organic butter sourced from grass-fed, sustainably raised cows. Good source of butyrate -- Butter is comprised of between 3 and 4 percent butyrate, a four-carbon fatty acid whose name is actually derived from butter. According to a study published in the Proceedings of the National Academy of Sciences in 2013, butyrate can help control the release of pro-inflammatory messages in the body, which reduces inflammation and prevents the immune system from attacking beneficial stomach bacteria. (2) For this reason, butyrate-rich foods like butter can help protect us from chronic inflammatory conditions such as Crohn's disease, colitis and leaky gut syndrome. Packed with vitamin A -- Though butter is not a great source of vitamins and minerals, it does contain surprisingly high amounts of retinol, or preformed vitamin A. In fact, just one ounce (28 grams) of butter supplies us with around 700 international units, or 14 percent of our recommended daily allowance, of the vitamin. (5) An important antioxidant, vitamin A is vital for the health of our eyes, skins, tissues, membranes and teeth, and even plays a role in gene transcription. A deficiency in it increases our risk of numerous medical issues, including impaired vision. Due to its versatility, butter can complement the health benefits of other foods to which it is added. For example, one of the world's finest sources of vitamin A is sweet potatoes. Adding some butter to sweet potatoes will not only improve their taste but also increase their vitamin A content further. Butter can also help decrease the glycemic load of starchy foods, such as white potatoes or pasta, by reducing the speed at which our bodies metabolize them.